Not until I was done baking and in the middle of taking picture that I realized that this tart looks very Christmasy, with red and green beautifully scattered over the top. I might want to bake another one on Christmas day for dessert. To make the shell: In a put processor pulse together sugar, salt and flour. Add butter cubes and continue pulsing until the the mixture resembles cornmeal. Add egg into the food processor, pulse for about 5 to 10 seconds more until the mixture forms clumps and lumps, add some milk if the mixture is too dry. Take the dough out of the food processor, knead lightly to make sure that all of the ingredients are well incorporated. Form the dough into a ball, wrap with plastic and store in the refrigerator for at least 1 hour before using. Preheat the oven to 375 F. Butter a 9-inch tart pan and set aside. Roll out the dough on a floured parchment paper into a 12-inch round. Using the paper as aid, transfer the dough onto the pan, peel off the paper, and use your fingers to make sure that the dough adheres very well to the pan. Trim the edges and pierce the dough with fork all over. Place the shell on the center shelf of the oven, and bake until golden brown. Remove from the oven and cool down completely. To make the custard: Place milk in a medium saucepan. Slit the vanilla bean lengthwise using a sharp knife, and scrape off the seeds into the milk. Heat the milk over medium heat until hot but not boiling. Turn off the stove and let it sit to steep, about 10 minutes. In a mixing bowl, beat cream cheese, sugar, cornstarch and egg yolks until creamy. Add hot milk gradually into the egg mixture, continue whisking until all of the ingredients are well mixed. Return the mixture into the saucepan, cook over medium-low heat while whisking constantly, until the mixture thickens and bubbly. Strain the mixture using fine-mesh sieve into a bowl. Let it rest to bring the temperature down to room temperature. Add brandy, if desired, whisk to combine. 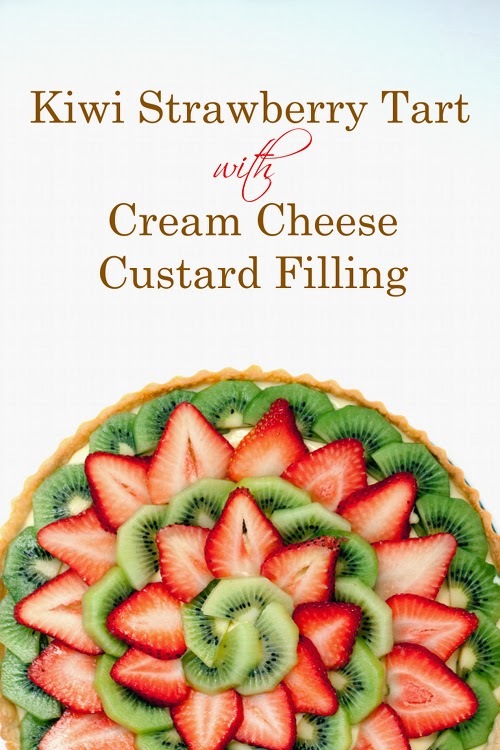 Fill the tart shell with the custard, use rubber spatula to distribute the custard evenly. Refrigerate the tart for at least a couple of hours to chill the custard completely. 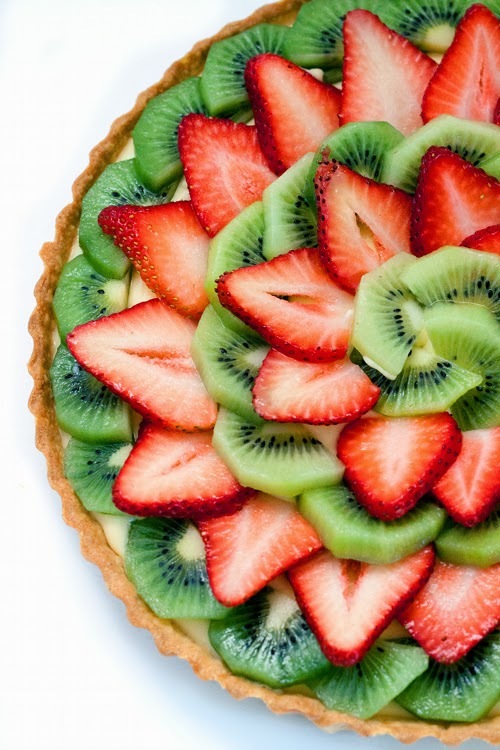 Arrange sliced kiwi and strawberry on top of the tart before serving. Serve chilled. 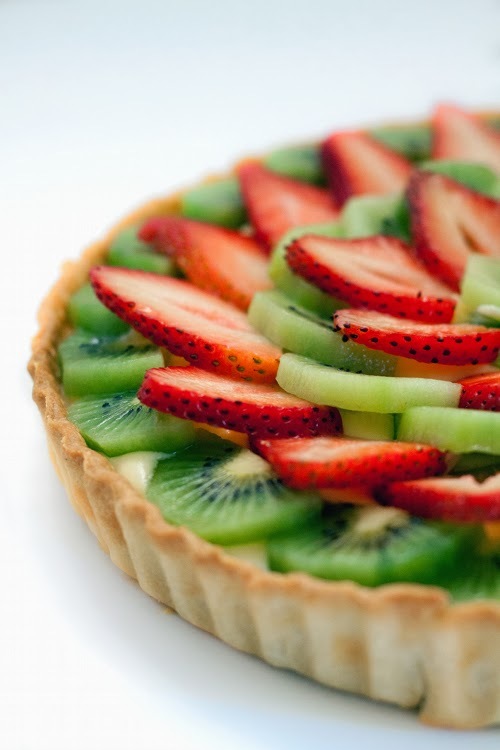 What a beautiful fruit tart! I really love how you arranged the fruits. wow, tangy fruits and creamy cheese custard sounds devine dessert! Wow that display of fruits definitely made me drool. I am a little turned on now. I am a vegetarian. Why would not I be turned on. I made this today and It turned out wonderful. The custard is a tasty and perfect. If you haven't made this you need to. Thanks for sharing this with us. It is really tasty. I have just followed your guide to make my own version.